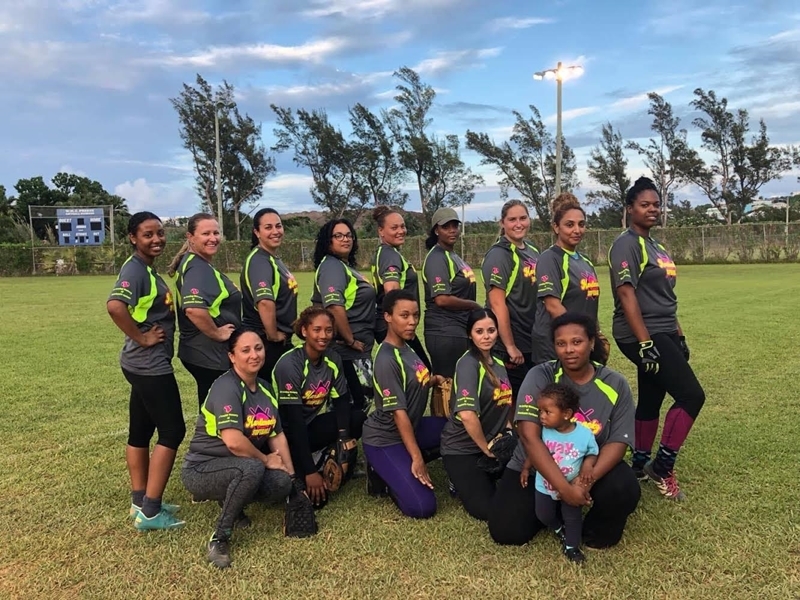 Inspired by the loss of a teammate, Hardknockz won their first Women’s Division softball title when they beat multiple defending champs Angels 11-9. Angels were not going to relinquish their title lightly as they took a 3-2 lead in the first and added three more in the third to go up 6-5. They picked up a single run in the sixth and things looked promising in the bottom of the seventh when they plated the first two batters, Latroya Darrell and Nikita Trott who reached on errors. Casandra Trott [2-4] drove home Nikita before the numbers three and four hitters went quietly. Both Antionette Rabain and Terry Paynter were 2-3 in the valiant effort to try to retain the title. Hardknockz dedicated this year’s softball season to Dashunte Furbert, who passed away. They put her name on the sleeves of their jerseys. A momentum shift change occurred when Hardknockz scored three in the fifth to take the lead for good. Jade Weaver [3-4, 3 RBI] supplied the big hit in the inning. Cleanup hitter was instrumental in the win in going 3-4. Hardknocks, sponsored by the In Motion School of Dance, had dedicated their season to teammate Dashunte Furbert, who has passed way. A team spokesperson said, “Last year Hardknockz suddenly lost one of our most dedicated team members, Dashunte Furbert. Dashunte was like the glue for our team, losing her took a piece of the team that we will never be able to replace. At the last softball prize giving she jokingly took other teams’ trophies and posed with them as if they were our own. Chubb Kings won the B Division with a 17 to 8 triumph over Team Smokey. The Kings were up 5-2 after three but finally cracked open this tight affair with five more in the fourth. Dan Sullivan was the big hitter going 3-5 with three homers from the leadoff spot. Both Dianne Blais and Tory Richard were also 3-5 while team captain Kyle Smith was 3-4. Jade Spencer [2-2] and Lateef Trott [3-3] were perfect at the plate, and other Team Smokey players who batted well were Eugene Dyer, Dean Douglas and Jehen Fox who were all 2-4. The closest game of the week saw Sunglass & Watch Shop edge FIU Scared Hitless 22-21 in a game that was played in three acts. Sunglass opened their account by batting around in the first and scoring nine runs to take a 9-2 lead. The second through sixth innings saw a tremendous fightback by FIU who would outscore Sunglass & Watch 14-6 to hold a one-run advantage heading into the seventh. Fiu then piled on another four runs in the top half of the inning before an out was recorded. They would add one more and were looking at a victory with a 21-15 lead. Things looked bleak for Sunglass as they had only scored one run before quickly recording two out and then rallied back for an improbable victory as Adam Petty [4-6] knocked in the final two runs for the triumph. Teammate Steven Simons [5-5 started the inning with a solo shot. Sam Outerbridge, Daniel Ezekiel, Dave Boyce, Desmond Richardson and Chris Sabean all had three hits for the winners. FIU’s top batters were Marcellos Thomas [2-3, HR], Troy pitcher [4-4], Dominick Sabir [2-2], McKovio Burch [3-4], and Kenrick Richardson [2-3]. The regular season ends this week with games on Tuesday and Wednesday. The playoffs begin on Monday, August 13.